Looking for an activity for those wintry days? This fun holiday craft for kids will last the whole winter season! Post contains affiliate links. It seems as though snow globes and the holiday season go hand in hand. Nothing fascinates children more than a snow globe filled with a tiny winter wonderland. If you love snow globes, why not try making your own this year? There are several expensive and rather difficult variations of DIY snow globes online, but the good news is, you can make your own frugal variation for less! 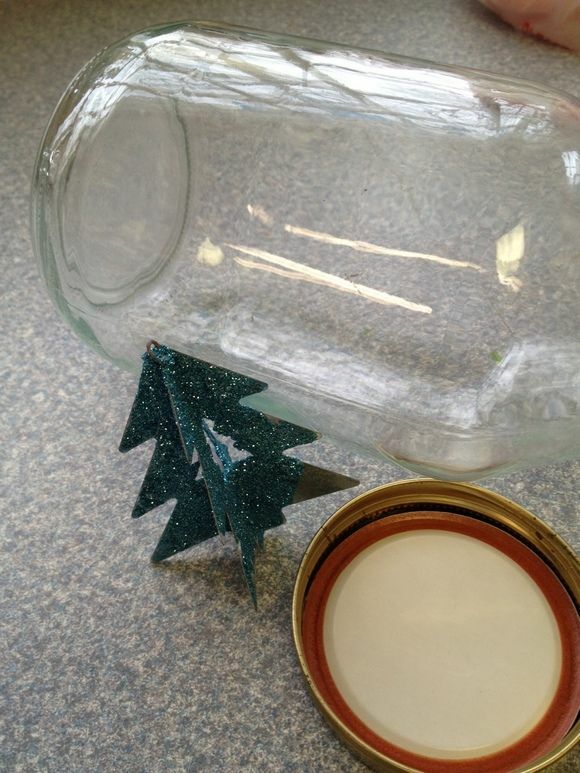 Using a few common household ingredients, you can make your own waterless winter snow globe to enjoy all season long. Take a look below at how to make this fun holiday craft for kids. Small winter accents such as a tree, plastic animals, etc. We were able to find a jar in our own kitchen recycling bin. Make sure you find a jar with a nice and tight lid. If you don’t have a jar, you can always find one at your local dollar store. Glitter and winter accents such as trees and mini animals can be found at your local craft store or dollar store even. Or, just see what little odds and ends you already have around your home or in your craft kit. As you can see, this is a great holiday craft for kids that is not only fun, but so frugal too. 1. Begin by cleaning your jar out well with soap and warm water. Dry it well. 2. Decide what fixtures you would like to place in your jar. We choose a small holiday tree and mini ornaments. 3. Apply a generous dab of glue to the bottom of larger fixtures you want to stay secure in the jar. Lower them into the jar and press them into place. 4. Drop in any accents that you wish to tumble around. 5. Now, fill the jar with a generous amount of glitter. 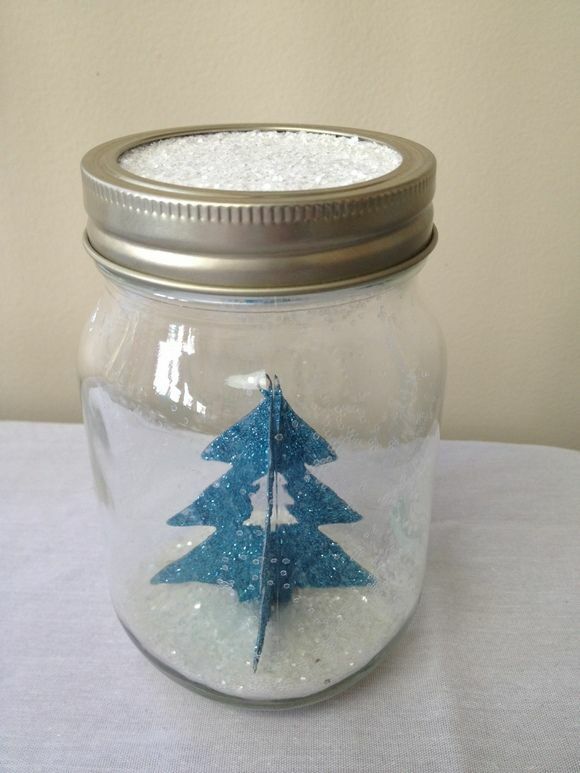 This will act as the snow and create a dazzling effect when the jar is shaken. 6. Replace the lid on your jar. If you are worried about little children opening it up, you can hot glue the lid on to make sure it stays secure. Just line the lid with some glue and twist it into place as you normally would. We also applied some glue to our lid and dipped it in the glitter for some extra dazzle. That’s all there is to creating a waterless snow globe. When you give the jar a gentle shake, the snow will fall and make the insides look like a wintry wonderland. Kids will love creating their own snow globe with all of the details of their choosing. Let them create something that is unique to them and reflects their own style. Waterless snow globes such as this also make great gifts for teachers, neighbors, or special friends. If your children enjoy gift giving during the holiday season, they can easily make several of these snow globes for all of their gift giving needs. So gather the kiddos and your supplies and give these waterless winter snow globes a try. You are sure to create some dazzling results as well. For more holiday crafting fun, check out our cute Santa candle holder Christmas craft for kids. what a fun idea! I think the grandbabies will love to do this for all seasons and any reason. I think this will be our next craft day project! I love snow gloves, I have a number of them in my curio cabinet. This is a great activity for kids to make as gifts. Very cool. I definitely want to make these with the little one! This looks like a lot of fun! My daughter would love to make it! I love this idea! I’ll have to wait a few years before doing this craft with my son, though. He’s already broken two snow globes. I love this idea. Can’t wait to try this year. The boys will love it.